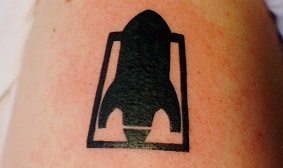 Would you get a brand's logo tattooed on your body if you could get a lifetime of free stuff or discounts? These people did, and we suspect at least some of them are regretting it. By definition, we here at DealNews, and our intrepid deal-seeking readers, will go to great lengths to save a little scratch. But just how far? Would you climb a mountain for free shipping? Name your first-born child after your favorite retailer for a discount? As crazy as that sounds, the consumers of the following six deals did something irreversible for a deal: each requires you to get a tattoo to redeem them. As you read over these instances of deal shoppers going to great lengths for a discount, keep in mind that you don't have to try that hard to get a great deal — our freebie hub has lots of free stuff that doesn't involve permanent bodily alteration. 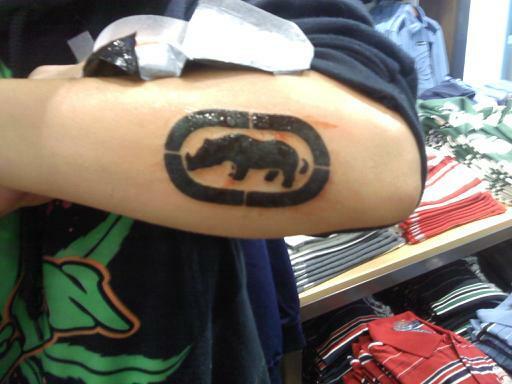 Ecko's ongoing "Branded For Life" promotion gives anyone who inks one of the compay's two logos on themselves a discount of 20% off for life. But before you head to your local shop with dreams of saving coin on some threads, note that this discount applies in-store only. So far, over 40 people have taken Ecko up on this promotion. 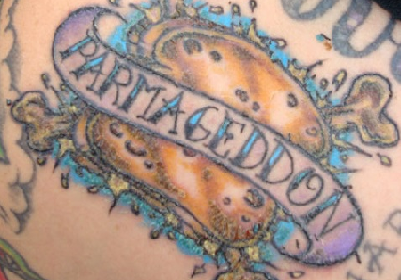 This small grilled cheese chain in Ohio bestows a 25% off discount for life to any customer who inscribes a permanent image of one of the store's three approved logo designs on her body. After a rough count of the images in their gallery, over 300 people have gotten in on this deal. 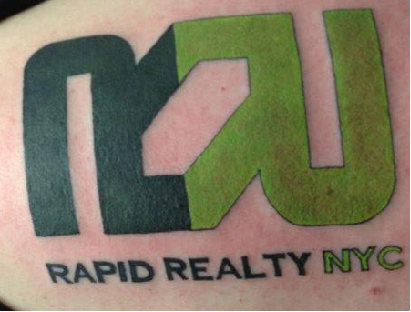 If you work for this realtor in the New York City area and are willing to put its logo on your skin, you will be given a 15% pay raise. Normally one has to go through a whole year of pain at a job to get a raise! [*Rimshot*] Not surprisingly, more than 40 employees have chosen to get a Rapid Realty tat to get a fatter paycheck. In a 1992 interview in a Zine (which was like a blog, but before there was the Internet), rock frontman John "Speedo" Reis said that any fan who got a tattoo of his band's logo would get free entry to their live shows for life. While many people get questionable band tattoos simply because they like the artist, this offer includes at least a fringe benefit. Fourteen years later, Reis noted that over 3,000 people have gotten a Rocket from the Crypt tattoo ... which often results in poor ticket sales at their shows. 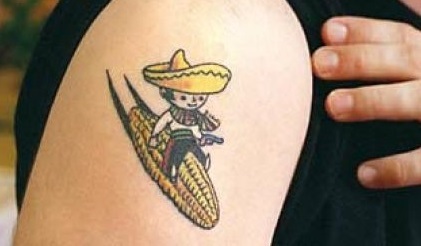 Thinking no one would actually do it, San Francisco Mexican restaurant Casa Sanchez put up a joke sign in 1998 saying that any customer who came in with a tattoo of the eatery's logo would eat for free for life. Well, the restaurant miscalculated folks' humor and underestimated the lengths they would go for a free burrito: 40 people got inked, and the restaurant calculated that if each of them got lunch everyday, it would cost $5.8 million. That hasn't happened, but just to be safe, Casa Sanchez limited the offer to the next 10 people to do it. 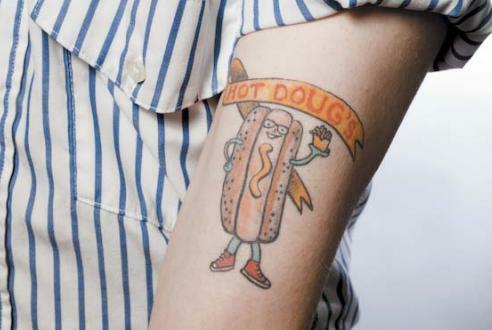 Here's a reminder that winning something "for life" could mean "the life of the business": this Chicago hot dog shop promised to serve up free dogs for life in exchange for putting its logo somewhere on your body — until it announced it is closing in October. Unlike the other restaurants, Hot Doug's even let you pick up items for friends: so while there's still time, befriend someone who likes getting random tattoos, and ride that gravy train as long as you can. Are there any brands or restaurants out there that you would get a tattoo for if they gave you a discount or free stuff? Let us know in the comments section below! I would get an I ♥ N Y tattoo if it would get me a break on my income taxes. @DailyDiscountDealsDish Sorry for our error, and thanks for catching it. The article has been corrected. In regards to Casa Sanchez, the company did not suffer losses of $5.8 billion, it's calculated that if the 40 people (they have decided to only allow 10 more patrons to "apply" for the deal making it 50) that have the tattoo were to get a $8 lunch every day for 50 years that is how much they would loose, according to the link provided in your story. We read your articles and trust your word and facts so please in the future use the proper information in your story. They have not lost this money and most likely never will. Yeah, and as soon as you'd get one of these, the place goes out of business! !